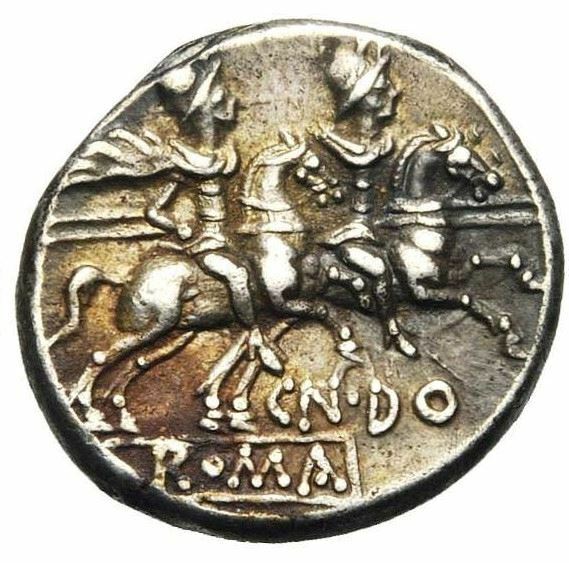 Gnaeus Domitius Ahenobarbus, son of the Gnaeus Domitius Ahenobarbus who had been consul in 192 BC, was one of the moneyers for the year 189-180 BC. He was the father of Gnaeus Domitius Ahenobarbus, who was consul in 122 BC. He served as pontifex in 172 BC, when still a young man, and in 169 BC was sent with two others as commissioners into Macedonia. In 167 BC he was one of the ten commissioners for arranging the affairs of Macedonia in conjunction with Aemilius Paulus. When the consuls of 162 BC abdicated on account of some fault in the auspices in their election, he and Cornelius Lentulus were chosen consuls in their stead. Gens Domitia was a plebeian family at Rome. The first of the gens to achieve prominence was Gnaeus Domitius Calvinus, consul in 332 BC. His son, Gnaeus Domitius Calvinus Maximus, was consul in 283, and the first plebeian censor. The family produced several distinguished generals, and towards the end of the Republic, the Domitii were looked upon as one of the most illustrious gentes.